Start spreading the news…New York, New York you’ve stolen my heart! The Big Apple, The City That Never Sleeps, The Concrete Jungle... you will realize there’s nothing quite like it. 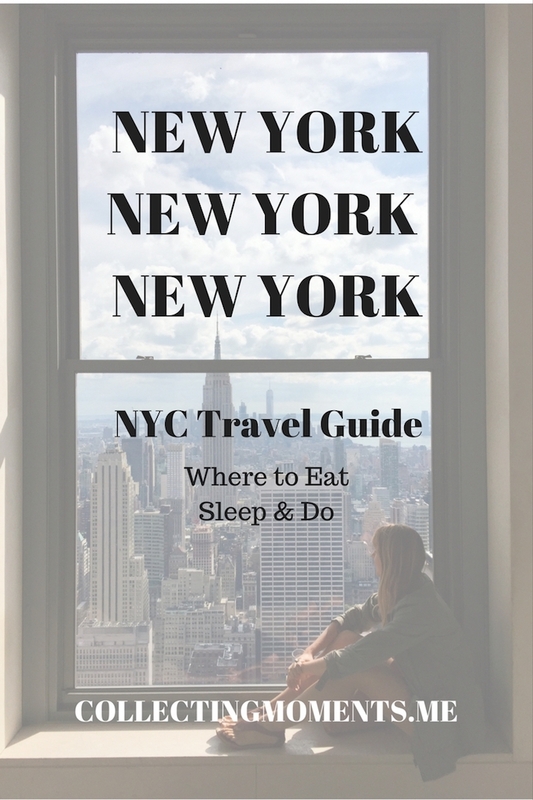 NYC is truly a melting pot of diverse cultures, food, and activities. From the Upper East Side, to buzzing Time Square in Midtown, to the hip and unique neighborhoods like the West Village and Tribeca to Chinatown, all the way down to the Financial District, and over the Brooklyn Bridge to trendy and upcoming areas, you’re BOUND to find a reason to fall in love with this city and have a good time! As I previously mentioned in Our Top Five NYC Restaurants post, this was my second time in NY and Guille’s first, and we got to experience it in a very unique way, as locals. We took our five days there at a very slow pace, and we got to experience the “fast-paced” city in a very calm and cool way! The first two days we dedicated solely to sightseeing (didn’t see EVERYTHING, but it’s okay, we’ll be back soon!) and then had three full days to simply walk around and enjoy the wonderful neighborhood, SoHo (Thanks Sebastian!) and surroundings. From the airport – I’m no expert when it comes to the NYC subway, but I’m pretty sure it can take you anywhere! Lol At least that’s how I felt! So, instead of paying hefty taxi/Uber fees, we comfortably took the subway to our Spring St. stop in SoHo (Lower Manhattan). What we did was ride the JFK AirTrain towards Howard Beach Train, and then we bought our MetroCards and transferred to the subway. The trip to Lower Manhattan took us about an hour, and we paid $7.50 USD/each; the MetroCard included AirTrain and NYC subway fares on one card. O-b-v-i-o-u-s-l-y, if you don’t want to spend that long riding the subway you can always Uber, but with traffic in NY, you might end up spending the same amount of time and much more $$$. Around the city – Walk! Walk! Walk! And when you’re finally tired, ride the subway. We are lucky enough to have relatives in different places around the world, and on this trip we stayed in my cousin’s apartment in SoHo. We ALWAYS try to rent a place on Airbnb when we travel, and this felt a lot like that since we were there while my cousin was gone. When you’re looking at places on Airbnb, the areas I liked the most were SoHo, the West Village, Greenwich Village, and the Meatpacking District in Manhattan, and Williamsburg in Brooklyn. Once Upon a Tart – Little French café in SoHo, perfect for yummy coffees and baked treats! The cheese and dill scone was lovely, as well as the almond milk latte. Hudson Clearwater – Great brunch spot in the West Village serving New American fare. Our food was so delicious, and they had very reasonable prices compared to other popular brunches in the city. I ordered the ricotta & orange pancakes and Guille the smoked-salmon toast with a side of sunny side up eggs. So good! Jack’s Wife Freda – Very well-liked bistro in NY serving American - Mediterranean food. We went here for brunch and didn’t particularly love it. However, I think we didn’t have much luck with what we ordered, and would definitely give it another try as everybody I know and other bloggers love it so much! Sanctuary T – New American tearoom located in SoHo that serves sweet and savory dishes. We went here for lunch and liked it very much! Very cool vibe and the food was tasty. I had the Fish Tacos and Guille the Tuna Poke Crostino + the green juice. Il Corallo Trattoria – Italian restaurant serving classic pasta dishes! So I really liked this place and its prices! We had dinner here, and I ordered the Ravioli Porcini Mushrooms served in a walnut cream sauce (yum!) and Guille had the Taglierini Sorrento (Squid ink noodles with shrimp, crabmeat, and clams in a white wine sauce) which he liked but didn’t LOVE as I did my raviolis. We also had a bottle of wine and enjoyed all of it for less than $70 (which I think is a good deal for dinner in SoHo!) Buonissimo! Ladurée – It’s a famous French luxury bakery, originally founded in Paris in 1862 and best known worldwide for its decadent macarons. There’re two locations in NY (we obviously went to the one in SoHo – as we did for 99.9% of the other places we ate, I know! Lol) I’m pretty sure EVERYTHING is good here, but I had the mille-feuille and it was perfection. Azul rooftop – YASSS, finally down to goodies - where to drink! Azul is a Cuban-inspired rooftop at Hotel Hugo located in Hudson Square! It has stunning panoramic views of the city and the river, and the Latin music was so fun. We went two nights in a row -- So, I’m guessing we liked it! They played a variety of old-school salsa with American favorites, and the second night even had a live salsa band! The décor is very trendy and drinks were good! Berry Park – It’s a cool German bar in Williamsburg that has a nice rooftop with views of Manhattan. We watched the sunset here after walking around Williamsburg, and the ambiance was great. So we ALL know the many world-renowned sights NYC has to offer, these are the ones we chose to see (and walked to 99% of them!) on this particular trip. Brooklyn Bridge – One of the oldest bridges in the U.S., and such a photographic structure not to be missed! We walked from Manhattan to Brooklyn. The High Line – 1.5mi park in West Manhattan built on an elevated old rail line. We walked all of it going uptown which conveniently left us on West 34th St. From here, we walked by the Empire State Building and headed to the Rockefeller Center. Grand Central Terminal – From the Rockefeller we went to Grand Central; a truly architectural beauty not be overlooked. Central Park – After Grand Central, we made our way to Central Park. We walked along the mall and saw only a tiny part of this immense and beautiful park. This was the last stop of sightseeing for us on that day, and made our way to Shake Shack at the Columbus Circle location for some delicious Shroom Burgers before riding the subway back to Lower Manhattan. Times Square – We visited Times Square LATE at night as suggested by locals, and it was great as it wasn’t too crowded. Financial District – We took a day to walk around FiDi, visit the 9/11 memorial, see Calatrava’s Oculus at the World Trade Center, and headed down to Historic Front Street. NY Public Library – Because we visited NY during Labor Day Weekend, we didn’t get to see the inside of the library as it was closed during holidays. So on our next visit, we plan on going inside and checking out the second largest library in the U.S! Liberty & Ellis Island – Definitely planning on seeing the Statue of Liberty up close on my next visit at Liberty Island, as well as visiting the Ellis Island National Immigration Museum. Museums – We were so lucky and had such perfect weather on our visit (no rain, sunny and mid-70s temperature!) that we decided to stay outside and do all outdoor activities! However, next time want to visit The MOMA, The Guggenheim, and the Whitney to name a few.